Just west of the kraton, are the ruins, pools, arches and underground passages of the former pleasure gardens, the Taman Sari (Water Castle). 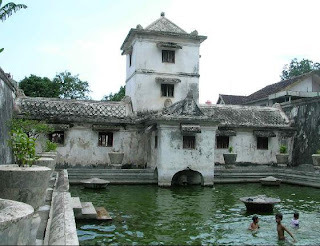 Literally “fragrant garden” Built in 1758 by Sultan Hamengkubuwono I, the Sultan and his harem would relax here and from the tower over looking the female bathing pools. It is located in the old part of the city within walking distance from the Bird Market. Open everyday from 8 am to 2 pm.